Sustainable Saunders » Blog Archive » Obama.. The First Green President? Obama.. The First Green President? by jamiesaunders ~ December 3rd, 2010. Filed under: Uncategorized. I recently discovered that the New York Times website features a blog called “Green – A Blog about Energy and the Environment”. As I was browsing through its most recent posts, an article entitled “U.S. 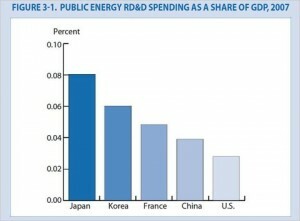 Needs Critical Boost in Energy Research, Panel Tells Obama” grabbed my attention. “Obama” tends to have that effect on a lot of people, even Canadians. The U.S. is spending far less on its energy research, development and demonstration than other industrialized countries, relatively speaking. An advisory group of scientists and engineers outlined a number of reasons why the U.S. must triple their current spending on energy research from $5 Billion to $16 Billion. The risk of being overtaken in the development of new energy. Security concerns arising from an overrelliance on foreign oil. The environmental threat of climate change. The reasons why the U.S. is lagging behind is a lack of public support and difficulty finding the funding. The advisory group has come up with a number of feasible methods for acquiring such funding; however, they have all been dismissed in favor of the government’s top priority, cutting federal spending. I was personally very surprised to find out that sustainability is so low on the U.S.’s priority list, and concern list as shown above. Perhaps all of the green messages that flood the media and market place led me to believe otherwise.